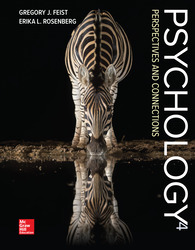 ·	What’s Covered: Comprehensive introduction to psychology challenges students' assumptions. ·	Teaching Approach: An accessible approach that asks students to think critically about their perspectives as they discover new psychological ways to approach real world situations. ·	What Makes This Product Unique: Power of Process in Connect, Challenge your Assumptions boxes, visual treatment of the research process.